A Business Bill of Sale is a legal document that recognizes the sale and change of ownership of a business and all its assets. The Business Bill of Sale sets the terms for the sale, details key information of the buyer and seller, and acts as a key record of the final transaction. When Do I Need a Business Bill of Sale? The Business Bill of Sale is needed and required whenever a business is being sold. The local and state governments need this document as proof of ownership for permits and other registration processes. If a Business Bill of Sale is not used, then ownership of a business may be questioned and disputed, among other legal ramifications. Selling a business is a long and complicated process. This is especially true the larger and more intricate your business is. It’s best to consult your attorney, sales advisory board, and even consider hiring a broker to ease the burden of the sales process. Below we offer some steps to get started. It’s also important to know the difference between a Business Bill of Sale and a purchase or sale agreement. A Business Bill of Sale is used to execute a sale and transfer of a business. It details the terms of the transaction at the time of sale and makes official new ownership of the business. A purchase or sale agreement is used to negotiate future sales or purchases. This type of document may be used in the initial stages of negotiations for securing business assets and terms, but it is merely a draft or promise of what the final transaction will be. 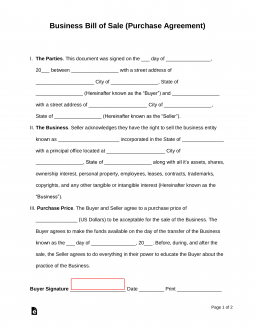 This document does not legally recognize new ownership or the transfer of a business. These are the typical inclusions on a Business Bill of Sale. Depending on the terms of your sale as well as state and local laws, it may be necessary to include additional information to execute the sale.